Can anyone brief a little about the link between the Byakugan, Rinnegan, and Sharingan? I know the meanings, but I don't know the relationship between the eyes. The progenitor of chakra, Kaguya Otsutsuki, was the first character (historically) to have Byakugan on Earth. 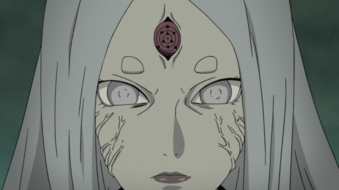 After eating the Chakra Fruit, she awakens a third eye on her forehead, the Rinne Sharingan. Now the Rinne Sharingan is completely independent of the Byakugan's influence. This is because the Rinne Sharingan is the result of the manifestation of the powers of the Chakra Fruit on a person. The Rinne Sharingan possesses the ocular power of the Sharingan, and can be used to cast the Infinite Tsukuyomi, an extremely powerful genjutsu which can only be countered by the Rinnegan and the chakra of the nine tailed beasts. When her two sons, Hagoromo and Hamura were born, they had their mother's Byakugan. As time progressed, Hagoromo awakens a new dojutsu, the Sharingan. In the anime, Hagoromo awakened the Sharingan after finding the corpse of his love interest Haori. The Sharingan is a derived form of the Rinne Sharingan, meaning, weaker. But powerful nevertheless. He goes on to attain the Mangekyou Sharingan also, but that is not shown on screen. Hagoromo then achieves the Rinnegan, after nearly killing his brother (and thereby freeing him from his mother's control). The Rinnegan is a much more advanced form of the Sharingan and it has a wide range of powers. The Rinnegan is stated to be something that is unique to the Sage of Six Paths, which is why, to obtain the Rinnegan, shinobi mix the chakra of Ashura and Indra (thereby getting Hagoromo's chakra). While the Byakugan doesn't have any direct link to the Rinnegan and Sharingan, it does play a significant role in their creation, along with the Rinne Sharingan. Like Akira said in the comment, they all come from Kaguya. That is, Kaguya owned both Byakugan and Rinnegan. Her son Hagoromo, widely known as Rikudo-sennin, inherited Rinnegan. His twin brother, Hamura inherited Byakugan. Hagoromo's son Indra owns Sharingan, while his other son Asura owned his great life force. Only when both are present then one can have Rinnegan. The Byakugan is a pure dojutsu by itself, while the Rinnegan and Sharigan are the separated dojutsu of the Rinne-Sharingan, the third eye manifested by Kaguya. The Byakugan seems to have existed before the Rinnegan and Sharingan as it seems to have been present in Kaguya's eyes before her arrival on earth. The Rinne-Sharingan came into existence when Kaguya ate the chakra fruit of the divine tree. The three dojutsu were separated when Kaguya gave birth to Hagaromo and Hamura Otsutsuki. Hamura inherited the Byakugan and Hagaromo inherited the separated Rinne-Sharingan, in their constituent forms, as the basic Sharingan and the Rinnegan. The Sharingan of Hagaromo entered its Mangekyou state after killing Hamura then resurrecting him using condensed sage power (nature energy). The Rinnegan seemed to be associated with the general Rinne-Sharingan pattern and six of the nine Tomoe, and the Sharingan represents the colour and three of the nine Tomoe. The Byagugan, Sharingan, and Rinnegan are all dojutsu, and are all passed down from Hagoromo Otsukiki, also known as "Sage of Six Paths". While they are all considered bloodline traits (Kekki Genkai), they also have diffferent abilities and characteristics. The Rinnegan's physical appearance is usually a white eye with a bunch of circles coiling around in it. The Sharingan is red, with 3 black tomoe mark and the Byagugan is an eye thats pure white and gray. It could be that the Rinnegan is a "diluted" version of the Rinne Sharingan. Like how the Sharingan can be considered a "diluted" Rinnegan as you need to mix Indra and Ashura chakra (Sharingan + Life Force/Sage's Body) to get Rinnegan. Something like genetic degradation/dilution due to reproducing with locale humans. They all come from Kaguya Otsutsuki. Kaguya's sons Hagoromo and Hamura were both born with the Otsutsuki family trait of the Byakugan. However, after the death of his loved one, Hagoromo awakened the sharingan, and after almost killing Hamura, awakened the Rinnegan. The sharingan and Rinnegan both come from Kaguya's Rinne Sharingan, the third eye on her forehead that she got after eating the chakra fruit, giving her the power to perform the Infinite Tsukiyomi. I'm going to assume you know how the Uchiha got the Sharingan and how the Rinnegan can be achieved. Hamura had the Byakugan, as stated above, and passed that down to his Otsutsuki descendants that lived on the moon, as well as his descendants that lived on earth, the Hyuga. There is also a Byakugan equivalent of the Rinnegan, the Tenseigan, that was first awakened by Hamura, and can be awakened by mixing the blood of the Hyuga and Otsutsuki of the Moon clans. Its powers are similar to that of the Rinnegan. Byakugan originally came from the Otsutsuki clan. Kaguya has Byakugan, since she is from that clan. 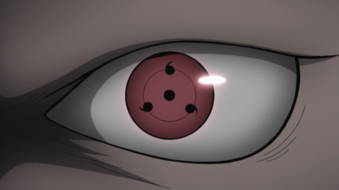 In order to cast the Infinite Tsukuyomi, Kaguya activated her Rinne Sharingan. Indra, a grandson of Kaguya, was born with the Sharingan. From him, the Uchiha clan existed, and they all could awaken Sharingan. Hagoromo, a son of Kaguya, had the Rinnegan. Sasuke was able to get part of the Rinnegan because Hagoromo gave it to him. By the way, I'm not taking into account the Naruto Shippuden fillers. Is it possible for a Byakugan user to awaken the Rinnegan? Does the Rinnegan eye put more strain on the user? How did the Sage of the Six Paths obtain his Rinnegan? Why can't Nagato revert his Rinnegan to Sharingan? 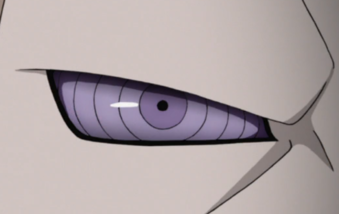 How powerful is the Rinne Sharingan? What are the exact abilities of the Rinnegan?